The sprinkler is weeping in front of my house, tears falling on the face of the lawn. The grass is missing those little footsteps, now that my children are gone. Yes, the sprinkler weeps underneath the old elm tree, casting shadows from above. The playground toys are rusted and falling apart, time eroding them away like my love. Blowing wind sounds like crying as it shakes the leaves off of the trees. Shutters slam and thrash about, it's enough to knock you down to your knees. Yes, the howling wind cries their names, across these wind swept plains. It's ripping all that's wholesome away from here, like these nagging pains. 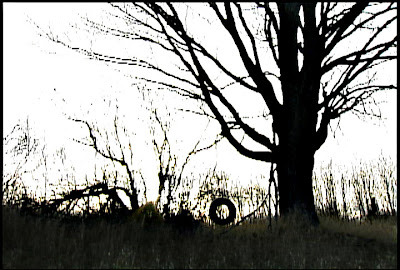 No kids swinging on that old tire, no innocent laughing in the wind. No giggles to lift my spirits higher, feels like I've got no friends. No piggyback rides, no slip and slides, no leap frog again and again. No hide and seek, no "Don't you peek." No way to make amends. Dark clouds cover the sun from shining down around here, a dark mood prevails. Cold wind blows, chills to the toes, revealing my pain and all it entails. Yes, blue northern raging quietly down, blanketing with cold this whole town. Driving all the warmth we need away, just leaving me to frown. The flower beds are bare and empty, no beauty to be seen there. The ground is hard and weed strewn, from lack of loving care. Yes, the garden is sad and fruitless, not a thing there to be found. Without love to help it produce, it sits just like barren ground. No hide and seek, no "Don't you peek!" No way to make amends. But spring is here again, mockingbird sings from the budding tree. His sweet melody floods this yard, brings a slight smile to me. Yes, the dawn of a new season comes, let God's creatures roam. Bringing me sweet hope again, that my kids might still come home. Giggles lift my spirits higher, I'm surrounded by my kin. Piggyback rides, slip and slides, leap frog again and again. Hide and seek, "No, I won't peek." I've been forgiven for my sins.